Last weekend I went to the Epping Ongar Railway, and rode some trains and buses, and walked to an old church, and came away with a real ale festival tankard for my trouble. I've written about the Epping Ongar Railway before, so I won't do so again. But while I was there I did pay extra-special attention to this sign beside the buffers at Ongar station. 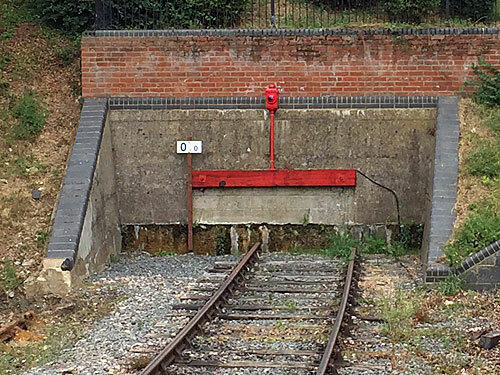 It marks the zero point on the Underground, from which all official distances are measured (even though the Underground hasn't actually served Ongar since 30th September 1994). Distances are measured in kilometres from Ongar. Epping is 9.85km away. Buckhurst Hill is 19.61km away. Stratford is 30.30km away. And so on. Here's my "and so on" list for the Central line, pausing approximately every 10km from Ongar. On other lines, distances are measured from a known point on a line already measured. A station is picked where the tracks run parallel, and measurement then extends in either direction, forwards or backwards. For example, the 'transfer' point for the District line is Mile End station (where the District runs in parallel to the Central line). Mile End is 33.07km from Ongar, so all distances on the District line are measured up and down from Mile End. The transfer point for the Piccadilly line is Barons Court (where the Piccadilly runs in parallel to the District). The transfer point for the Victoria line is Finsbury Park (where the Victoria runs in parallel to the Piccadilly). The transfer point for the Northern line is just outside King's Cross (on the so-called King's Cross Loop, a tunnel which connects to the Piccadilly). The transfer point for the Metropolitan line is Rayners Lane (where the Metropolitan meets the Piccadilly). The transfer point for the Circle line is Baker Street (where the Circle diverges from the Metropolitan). The transfer point for the Jubilee line is Finchley Road (where the Jubilee runs in parallel to the Metropolitan). And finally the transfer point for the Bakerloo line is Baker Street (where the Bakerloo runs in parallel to the Jubilee). To run that backwards, the official distance for North Wembley is 59.86km, measured back to the Jubilee line at Baker Street, measured back to the Metropolitan line at Finchley Road, measured back to the Piccadilly line at Rayners Lane, measured back to the District line at Barons Court, measured back to the Central line at Mile End, measured back to a set of buffers at Ongar that's no longer on the Underground. It's mad, but it's brilliant... or at least it is if I've understood what's going on properly. I unravelled all this from the excellent Clive's UndergrounD Line Guides, which I've been quoting on this blog ever since it began. It has an utterly invaluable page of data for every Underground line, and an introductory page detailing how all the data is measured. Thanks Clive! And if you'd like a map with all the distances on, because I suspect you probably would, here's one (courtesy of the website railwaycodes.org.uk, which I suspect is a timesink of infrastructure geekery on another level completely).